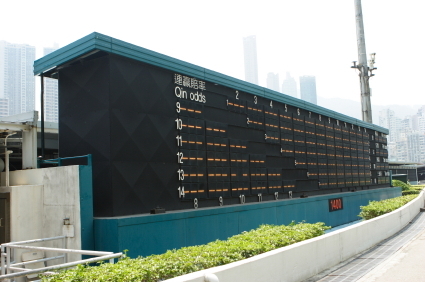 While even the newest to horse race betting knows what a bet to win is, even the traditional bets can be confusing. When it comes to gambling, you should always know exactly what you are betting before wagering any money. These bets are considered ‘straight’ bets, and are typically offered on every race, unlike the more exotic bets who may not be offered on every race. Make sure to read the race program to find out exactly what wagers are offered and what the minimum wager is. For this bet to pay out, the horse you choose must come in first place. It is important to always wait for the official results to be posted. Even if you are watching the race now and then a horse will be disqualified, or a photo finish will need to be approved by the judges before the official results are posted. For this bet to pay out, the horse you choose must come in second place or better. A Place bet may not pay out as much as a Win bet, but as your horse may come in first or second it is a little easier to win money. For this bet to pay out, the horse you choose must come in third place or better. Show bets pay even less than Place or Win bets, but offer a greater likelihood of paying out as your horse may come in first, second or third and you will win money. At first glance you may see this bet and wonder why anyone would bet this. For this bet to pay out, your horse may come in first or second. This bet is different than a simple Place bet which also pays out if your horse comes in first or second because the Win-Place bet is two bets in one. If your horse comes in second you collect the Place payout, the same as a Place only bet. However if your horse comes in first place, you collect the Win payout and the Place payout. Betting Across The Board, your horse must come in third or better. This bet can also be referred to as Win-Place-Show, however you will sound less saavy. Simply saying “Across the Board” means the same thing. This bet works the same way as the Win-Place bet does. If your horse comes in first, you win the payout for all three bets. If your horse comes in second, you win the place and show payouts. This bet is very conservative and while there is an additional investment in this bet, the addition of the Place and Show options allow you to recoup some of your bet even if your horse does not win.